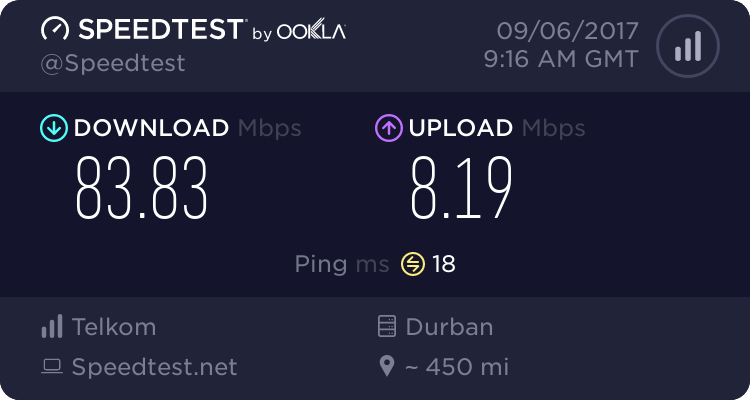 My upload speed is sitting between 15 and 20Mbps but my downloads are so sucky....how Telkom?? I wonder what do the ISP's do.... they rollout LTE and LTE-A in different areas right. Obviously if you have quite a few LTE users connecting to the same tower. Quite a few devices support LTE and LTE-A nowadays. (ranging from tablets to Laptops, Cellphones and obviously the Mifi devices and LTE Routers). Say 50-80 users connecting to one Tower (which is not a bad amount of users, a typical tower can probably do 300 to 400). How do the ISP's calculate when to Upgrade the towers fibre or double up their capacity. Back in the day when you only had 3G and HSDPA it was a fairly easy task. Devices only consuming maybe a meg or 3, some might have pushed a 8mbit to 15mbit etc. Now you have devices that when streaming 1080p video or even 4K video (or just plain burst speed uploads of WhatsApp pictures , videos and joke clips). LTE will have a much higher speed to contend with. Copy and paste to all the mobile network providers, I C.
I heard that at least one of the mobile operators are over subscribing their tower by as many as 70%... Money is more important than happy customers. I've had this uncapped LTE deal from Telkom now for about 9 months. I have been contacting them now, going 6 months with regard to an antenna with no joy. I'm at the end of my rope I don't know what to say to these people anymore or what to do anymore. I've been "escalated" over a dozen times by now. 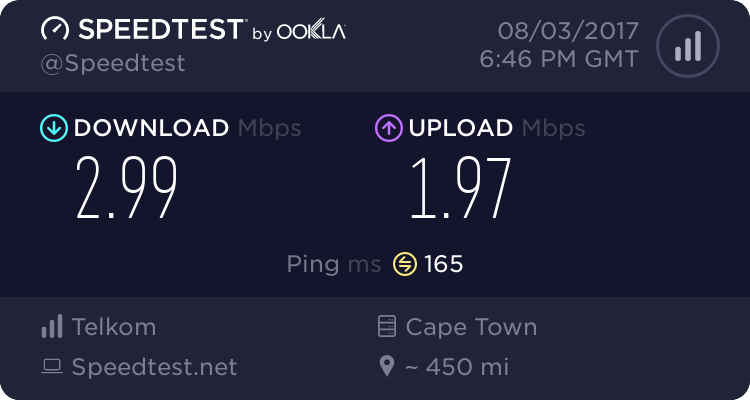 I've spoken to different people in different Telkom stores, spanning CITIES to try and get my speed issues resolved, they will just not assist me. Friends of mine who are the reason why I got this deal same as them have all been given antennas with little to no hassles, I am the only person I know of who is having this issue. All I know is this speed is unacceptable, at the start of the week I got 1.3mbps, speedtest didn't even want to finish the test. I'm located in PE, roughly 8 blocks away from one tower and 6 blocks away from another. I'd appreciate any help. Thanks for any assistance. sorry to say the antennae wont help the towers are too congested you might get maybe up to 8mb im like 250 meters from my tower and stuck on 10mb since last year icasa cant help they will just give you the choice to cancel without penaulty. sorry mate for being the bringer of bad news with Telkom LTE ive given up. Please post you area might help other users. NOTE: This is in the same house. My guess is a mix of congestions / throttling? Congestion was giving me a hard time on friday night. only got speeds of about 4mbps down etc. my speeds right now are pretty decent, although i think early in the mornings people are streaming etc. Are you using an external antenna? Those are great speeds, totally nullify your need for fibre whilst it's still in its embryonic stages. Sorry - that's my fastest yet - not everyones.